as our sponsor, be sure to read the information at the bottom of my post on how you can play along for your chance to win a fantastic prize from this weeks sponsor. This weeks inspiration piece is quite lovely, Mona picked the colors: Kraft, Raspberry, White and Aqua (see the inspiration piece below). I went through my papers and pulled out the following card stock Kraft, Melon Mambo, Watercolor and Soft Sky to work with. I think it took me longer to decide how I was actually going to layer the panels than it did to create my card! I thought the Holly Hock image from Mark's Finest Papers would work perfectly with this weeks challenge, as it allowed me to add in that touch of Raspberry - or in my case Melon Mambo to the flowers. The images are stamped in Sepia, then colored using the Marker Watercoloring Technique. To add some texture under my images, I embossed the Kraft panel with the Brick Wall Texture Fades Folder, and the Soft Sky panel with the Damask Folder, adding a bit of ink to highlight the embossing. Here's this weeks Color Story Photo, we'd love for you to play along with this weeks challenge at The Play Date Cafe, you can find all the details here on how to enter. If you upload to any online gallery please use keyword PDCC#33 so we can find your creations! Lovely flower and hummingbird. Beautiful coloring. I've been curious about the brick embossing folder (So glad you used it. ;) Love the layered embossing too! Beautiful card. You are too funny!!! Your panels looks great and the flower is beautiful. I just made a card last night with these colors but need some help with what it's still missing so I'm pondering about it today!!! Right up my alley although my raspberry is a little lighter. Beautiful!!! Wonderful layout and the coloring is fabulous!! I had doubts about that brick EF, but now it is another got to have! Very pretty Lisa! It's funny how certain elements of creating can take such a long time! Lovely card! Sweet card and love the design you created! This is a great card, Lisa and a wonderful way to use the colors this week! Such a beautiful card and I love the stamps you used! 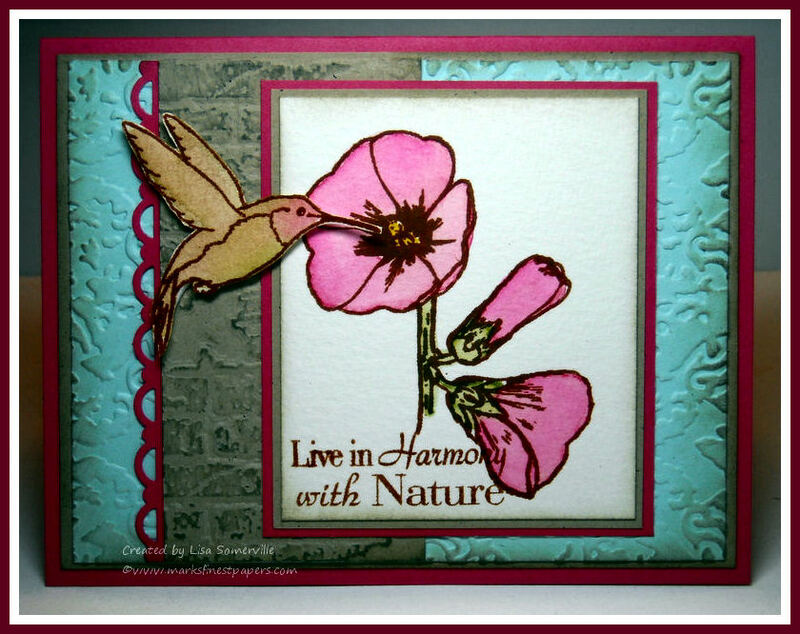 LOVE the flower and hummingbird! Love the embossing! Hi Lisa....your card is beautiful!!! what a lovely piece...you know I would frame your work!!! beautiful!!! Beautiful, Lisa! The flower is so pretty and I especially love the hummer! !